Vivamune Health Chews are a brand new approach to managing your pet’s health and wellbeing. Our revolutionary all-in-one immune supporting formula targets joints, skin and digestive health – all in a delicious, once a day chew your pet will love! Other pet supplements can be messy and inconvenient, requiring multiple doses throughout the day and putting a strain on your schedule and your wallet. Only Vivamune works from the inside out to optimize immune health and rejuvenate the skin and joints – all in a single, daily dose. Environmental stressors and a sedentary lifestyle can compromise your pet’s immune health. Vivamune Chews’ unique formula harnesses the healing benefits of beta-carotene to optimize immune function and rejuvenate health & wellbeing. 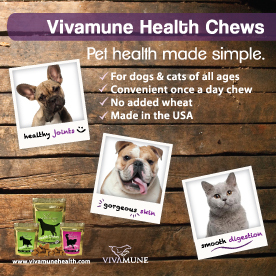 Vivamune Chews are great for dogs and cats of all ages and can be given to pets as young as 6 weeks of age. Join the Evolution! Try Vivamune Chews for 30 days and see the results for yourself! Visit www.vivamunehealth.com to learn more. * Vivamune Chews are made in the USA and contain no added wheat products.